Next in our hunt for the best replacement dialer app is Touchpal from the developers at CooTek, the same team behind Touchpal Keyboard and Search. 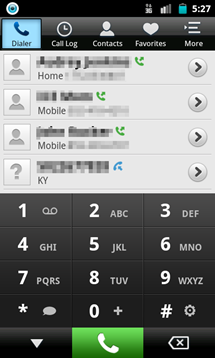 CooTek's dialer is extremely well-designed, unassuming, and easy to use. It combines most of the features I want in a dialer but doesn't attempt to overdo things with too many superfluous or redundant functions. 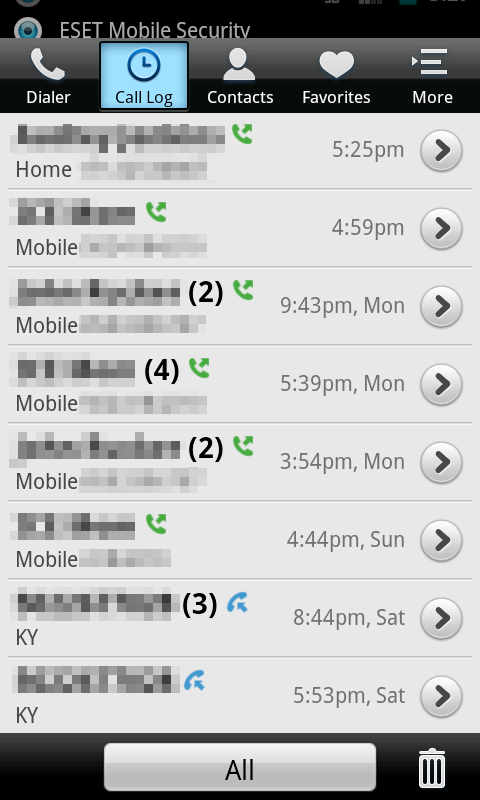 Best of all, the dialer is totally free. Immediately after installing Touchpal, I was impressed. The design is clean, simple, and unassuming. It combines the familiar tabbed browsing of Android's stock dialer with a dialpad/call log screen reminiscent of HTC's Sense dialer, in a way taking the best aspects of both and combining them into a simple, lightweight app. Touchpal is a very basic dialer replacement, adding just enough functionality over Android's stock to make it worth keeping, and it performs just as smoothly and consistently as well. 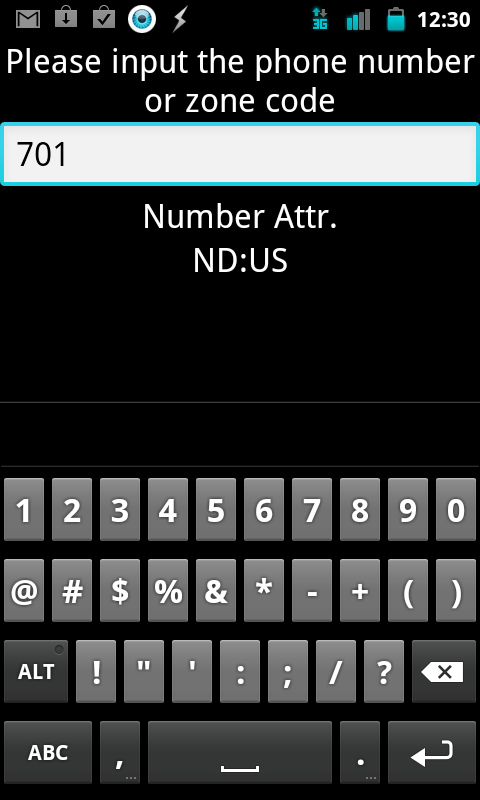 The first feature worth discussing is the dialer itself. 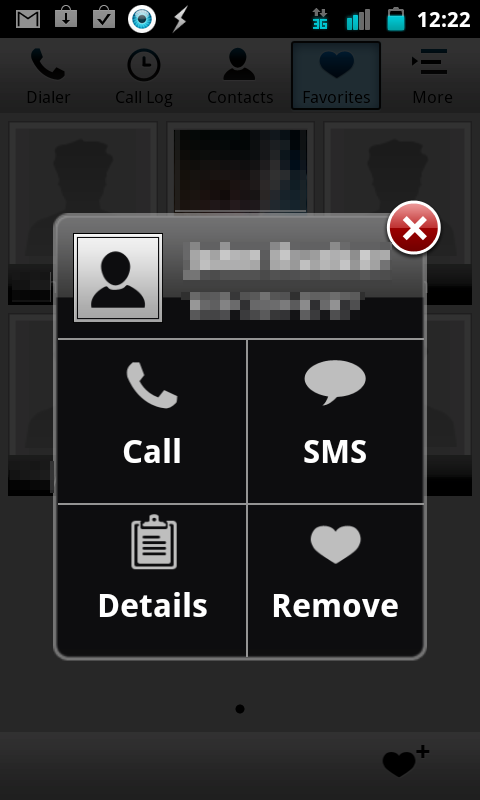 It's a simple layout - the user is presented with a number pad and a "recent calls" log which can be swiped to display all contacts. 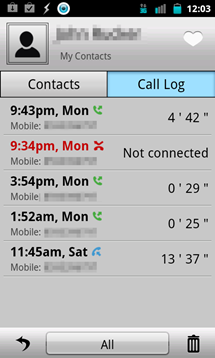 Tapping on an entry in the log will trigger a phone call directly. Tapping on one of the arrows next to a contact will open a screen allowing you to initiate a text conversation, set a ringtone, group the contact, add a note, or block the caller. Seeing the addition of all these features was refreshing, as it makes a dedicated call blocker unnecessary and adds nice functionality to the app. Back at the main screen, holding down the pound sign brings up the app's settings, allowing for theme changes and other tweaks, such as which screen displays upon opening the app, what country and area code you'd like to use, etc. The ability to set a default country code is a nice touch, useful for those who use internet calling when out of the country. Holding down the star symbol will send you directly to your default messaging app, or, if you've typed in a phone number, a conversation with the contact you've chosen. This too is a handy feature, but it's a bit redundant given the fact that you can initiate (or continue) a conversation with a given contact by pressing the arrow next to their name. 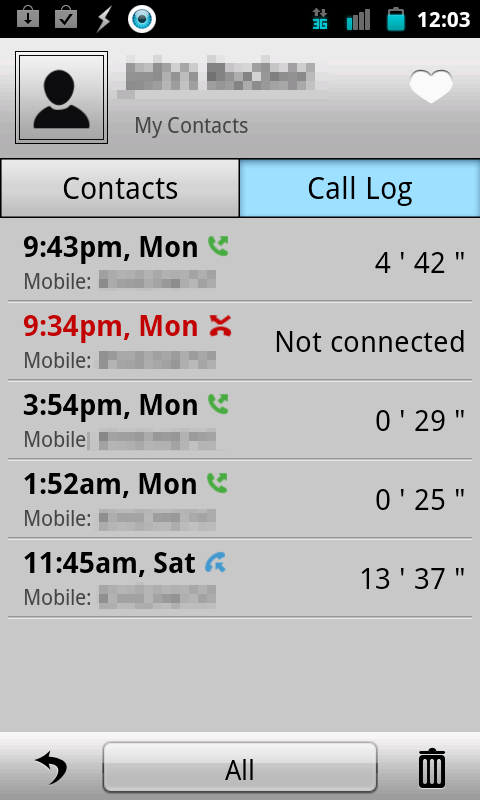 Next up is the Call Log tab. 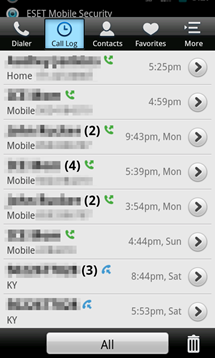 This is essentially your average call log, but pressing one of the arrows next to a contact name will take you to a complete history of recent calls both incoming and outgoing, and give you the option of adding the contact to your favorites list. One thing that's worth noting is that this screen also allows you to switch to the contact's individual "profile," or contact page, and opening a contact page likewise allows you to switch to your call log for that person. This is a redundancy that actually adds something to the app, making it that much faster to get to the information you want. 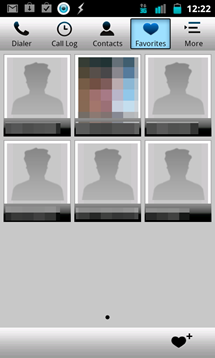 Next is the contacts tab. This again is your basic contacts list, with a search bar and the ability to click a contact and view/manage their information, ringtone, etc. The user can also jump to a group of contacts based on what letter their name starts with, which is a little superfluous given the fact that scrolling brings up a big scroll bar which, when manipulated, can be used to navigate according to letter. 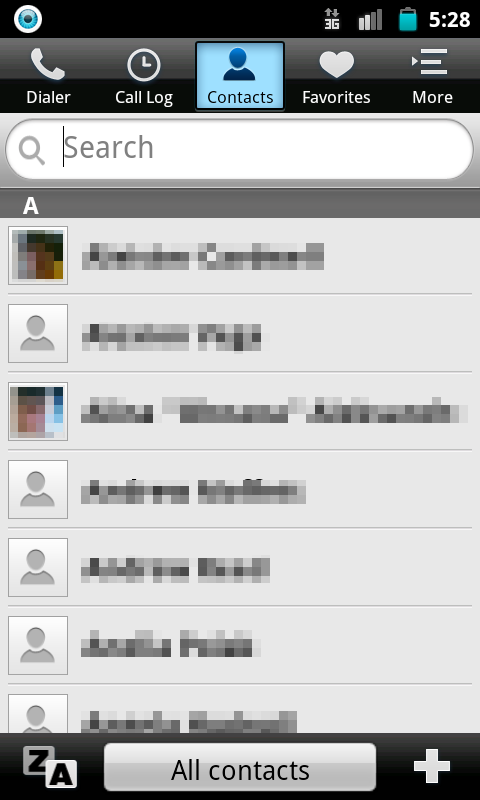 Finally we have the Favorites tab, which displays - you guessed it - the contacts you've added to favorites. This was a surprisingly useful feature, and has some subtle functionality that was both surprising and impressive. It appears that the app orders your favorites according to how often you interact with them, putting your most-called contacts at the top of the list. When the user taps on a contact, a window pops up giving the option to call, message, view details, or remove from favorites. The More tab doesn't have a whole lot in store, offering a couple of features that are more of a curiosity than a useful set of functions. The first of these is the "Where's the number" option which tells you the location of any area/zone code. Next is the voice dialer, which takes voice commands you may already be familiar with such as "Call Jane Doe," etc. Finally, there's an option to contact the developers via email directly, which is kind of handy in case you run into any bugs. 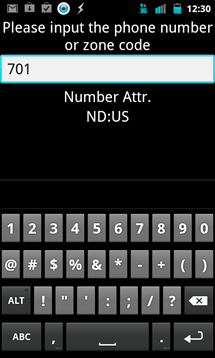 Overall, CooTek has put together a nice dialer alternative. It covers the basics and goes a little bit further, and does it with style. While minor, there are still a few bumps the developers could iron out that are worth mentioning. It's Free - You may have noticed from previous reviews that I love free things. 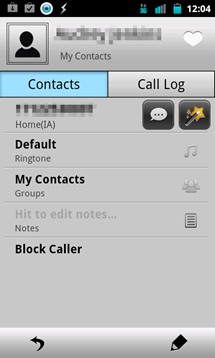 Especially free apps that are as well designed and thought-out as Touchpal Dialer. Features - Touchpal has included all the features I want plus a few surprises that ended up being useful. 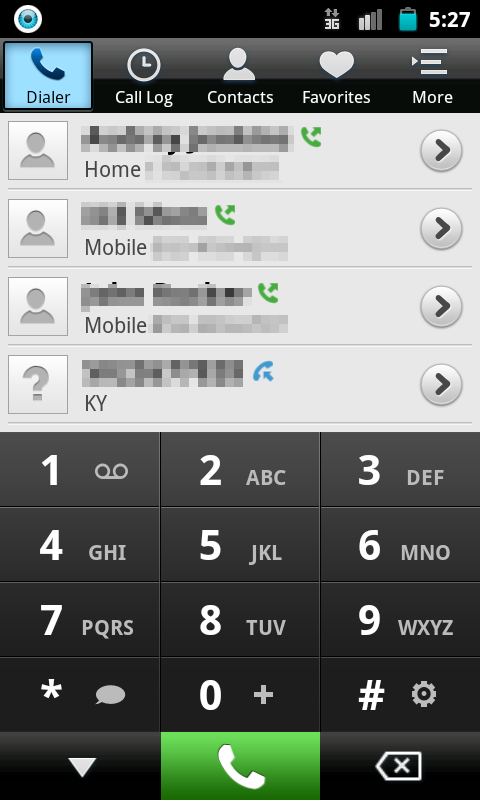 Ease of Use/Interface - As I've said numerous times, this dialer is easy on the eyes. The themes included are subtle and classy, and don't overdo it. The app couldn't be easier to use either - the controls are intuitive and simple, and do what you expect them to do. It Could Use Polish - The app could use a little bit of sprucing up, but not much. The "More" tab seems somewhat excessive, as I feel the two features it includes could just as well be integrated into other screens. 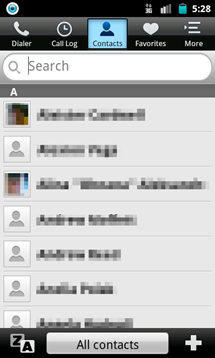 There Are Some Redundancies That Aren't Useful - This is a small point, but things such as the redundant letter-based search in the contacts list could be eliminated for a smoother experience. In the end, Touchpal offers a great dialer with plenty of useful features which manages to keep a lightweight feel and smooth functionality. There are a few redundancies but on the whole it's a good experience, and I am considering it as my daily-use dialer until I find something better. Considering the app is free, I recommend heading to the market and giving it a try.